This is the treasure of my art collection. It was carved in 2001 by the Seattle, Washington carver, John T. Williams. I purchased it from Mr.Williams, who was putting the finishing touches on it when I met him on Broadway East, on Capitol Hill, in Seattle. 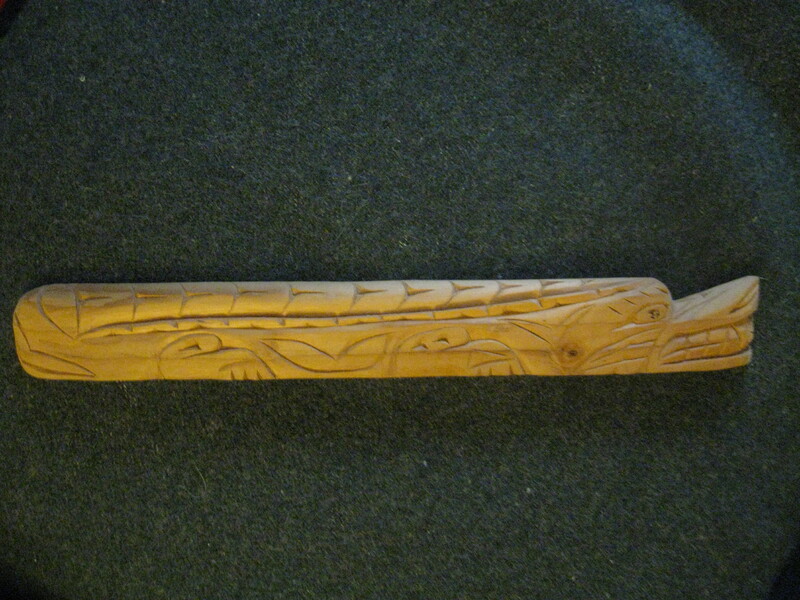 Having purchased another carving from Mr. Williams earlier that year, and being very happy with it, I immediately asked him to sell me this piece. He was happy to make that happen. We agreed upon a reasonable price. 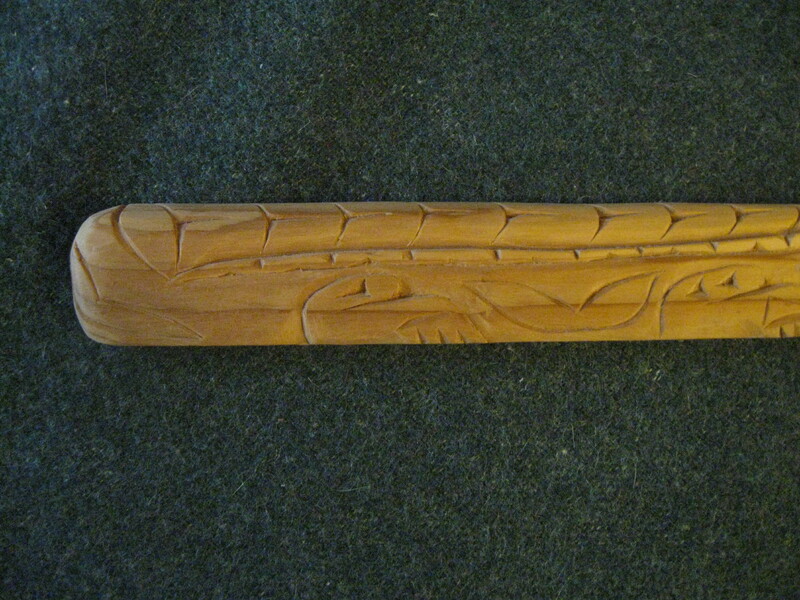 He signed it for me on the reverse side with his carving knife. I learned from John that the carving depicts a sea serpent. It measures 12″ x 1.5″. It appears to be carved from pine wood. 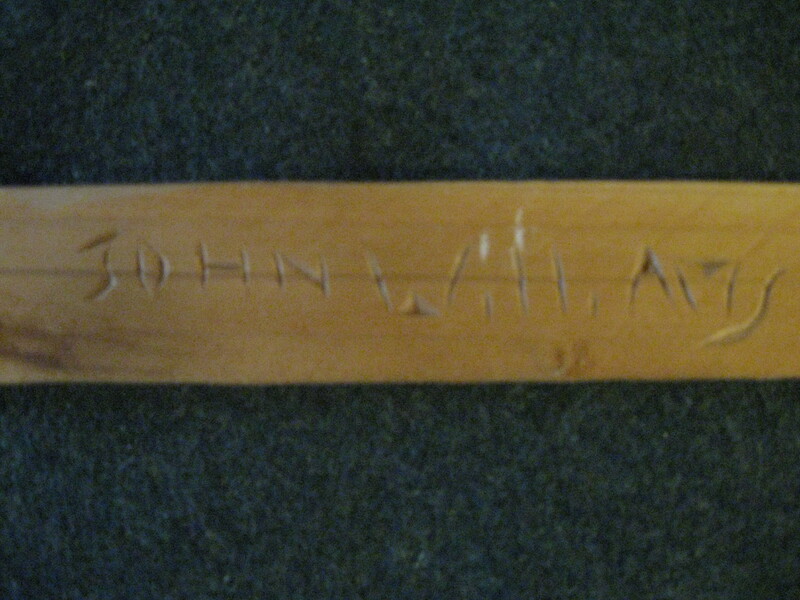 John found his carving material as he walked the Seattle neighborhoods he frequented (usually the Broadway or Eastlake areas). Therefore, his carvings were created from various types, sizes and shapes of wood. But John’s carvings were not randomly done; they depicted a scene from life, or were totemic in nature. On this and every occasion when we met, I was sure to tell Mr. Williams how much I respected him and his work. I’ve spent half my life collecting art made by human hands, and I have a great love for artists. John’s art is even more important to me, because of its cultural significance. The Williams family has been involved in carving for well over a hundred years, and seven generations. Seattle’s Ye Olde Curiosity shop, located on the waterfront, has purchased carvings from five generations of Williams carvers. 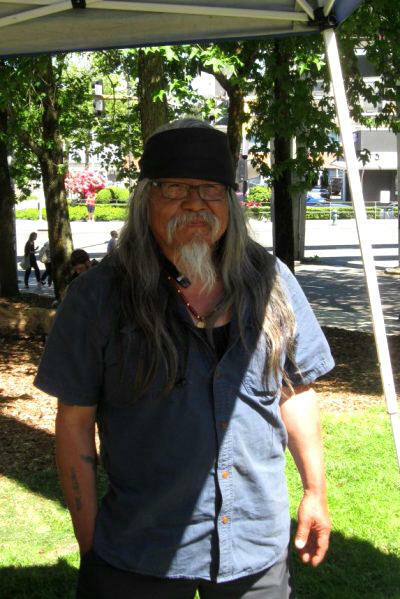 John’s family comes from the Ditidaht First Nations people of British Columbia’s Vancouver Island. 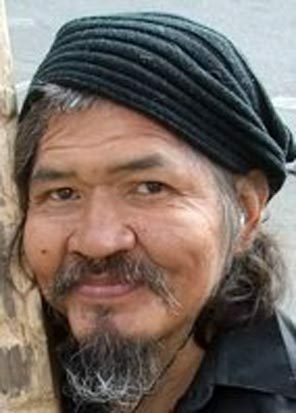 Mr. Williams lost his life on August 30, 2010, when a Seattle police officer stopped him because he saw him carrying a knife. He subsequently shot John to death. The Seattle Police Department determined the shooting was unjustified, and the shooter resigned from the force. The Williams family lodged a claim against the City of Seattle, and a financial settlement was reached. Mayor Mike McGinn declared Feb. 27, 2011, John T. Williams Day in Seattle. When I bought the carving from John T. Williams, I had no idea that he would be cut down at age 50, while doing what he loved to do: creating beautiful figures from whatever piece of wood he was able to find. I bought the carving because of its beauty and importance, from a man who was always kind to me, who showed patience, and took the time to tell me the story behind the carving. I mentioned that I had previously purchased a piece from Mr. Williams. 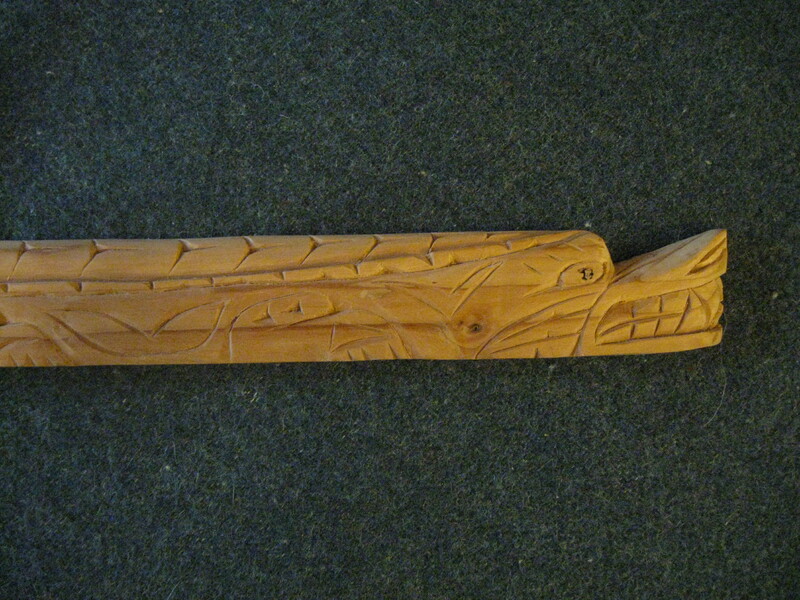 After his untimely, uncalled for, and tragic death, I gave the other carving, which depicted a man teaching his son to fish, to a friend of mine whom I knew would appreciate it. I felt a need to share his work with someone. Rather than having two pieces, I am more content with having one, knowing that my friend has the other. I grew up in Yakima, WA, home of the Yakama Nation, a plateau tribe. Plateau and plains indigenous art is quite different from that of the North Coast tribes. When I moved to Seattle in 1974, I was amazed to see the carvings, bent wood boxes, weaving, and other art created by coastal artists. Not a lot of that art, or information relating to it, had made it to my side of the Cascade Mountains, prior to my leaving that area. I’ve spent 40 happy years familiarizing myself with it. Here is a photo (below) I took on May 28, 2017, of John’s older brother, Rick, who is also a carver. We talked about how we knew each other back in the 1970’s or early 1980’s, when we then-young men frequented Seattle’s Pike Place Market. Rick, John, and at least one other brother carved, and I busked. 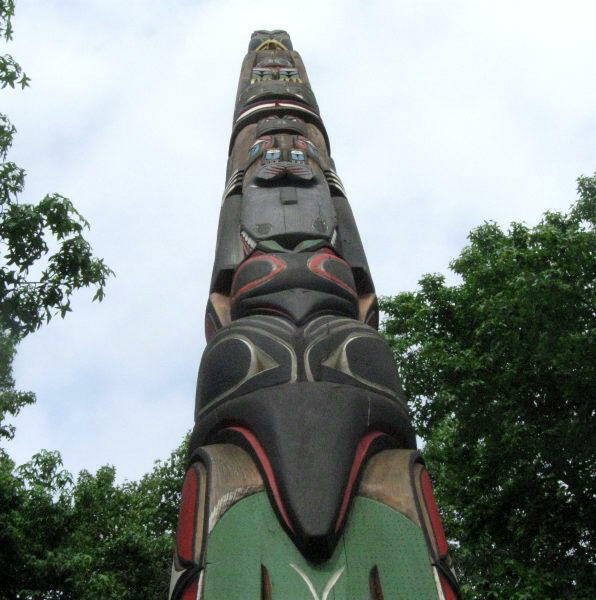 In February of 2012, a beautiful totem pole was erected at our gathering space, Seattle Center, in honor of John T. Williams. 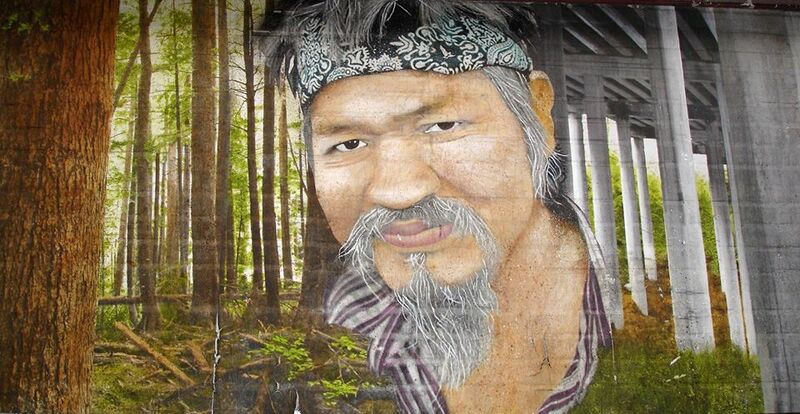 Rick Williams was one of the project’s major carvers. I live withing walking distance of the Center, and have had the pleasure of viewing and photographing the pole, many times. I note that there is, among several signatures near the base of the 3,500-pound carving, a signature of a Paul Williams. I haven’t been able to ascertain whether or not Paul is another brother. May that totem pole stand for many, many decades, if not centuries. Here is a photo I took. The pole is located near MoPop, or the Museum of Popular Culture, formerly known as EMP. I worked there from 2000-2004.